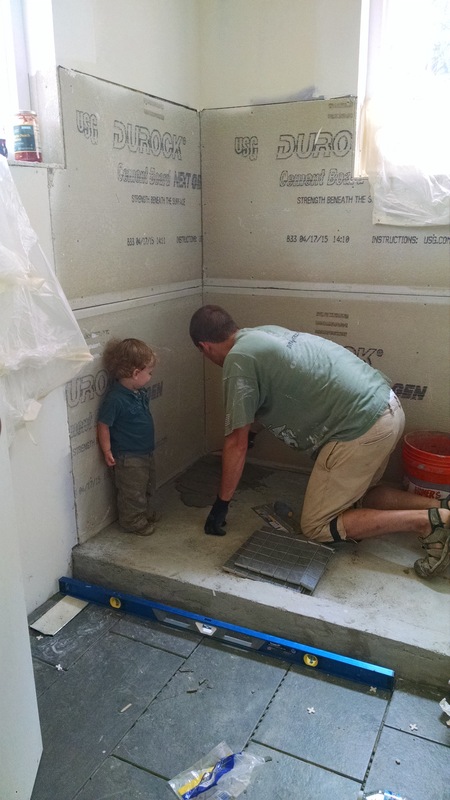 Case Study House: 1.19: moving INSIDE…tile work! Slowly but surely this house is starting to feel like our home! As overwhelming and frustrating as it can be to make all of these decisions…based on both what we like and what we can afford as well as what we can find available without special order…it’s been fun! 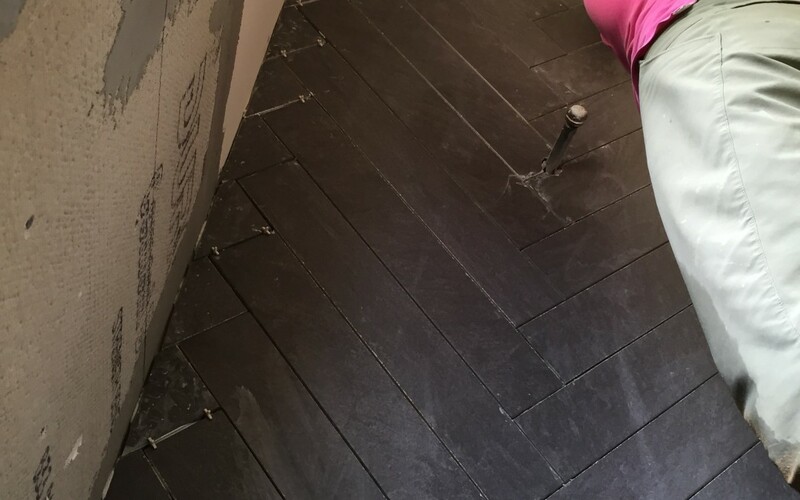 After getting laughed out of tile shops when we mentioned our TIGHT budget…we were able to find some pretty good options at Lowes. We stayed in the $2.00/SF and below range. 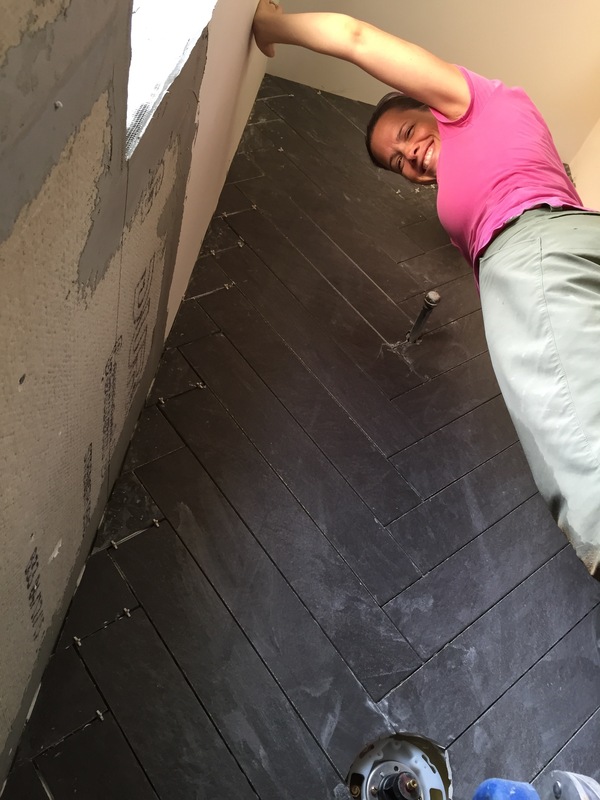 Our entry floor extended into the mudroom and bathroom we wanted a slate tile…and ended up finding this decent dark grey 12×24 tile that we both liked…. 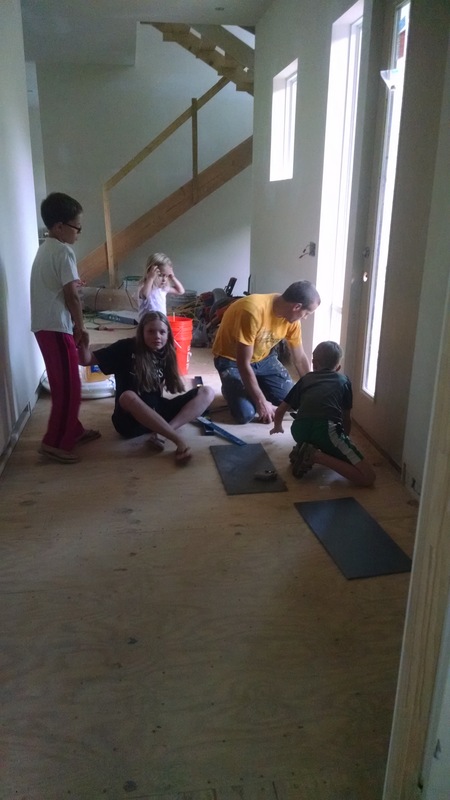 We got all the kids together for a quick family home evening HOW TO TILE lesson. Slowed us down a bit…but we had fun! 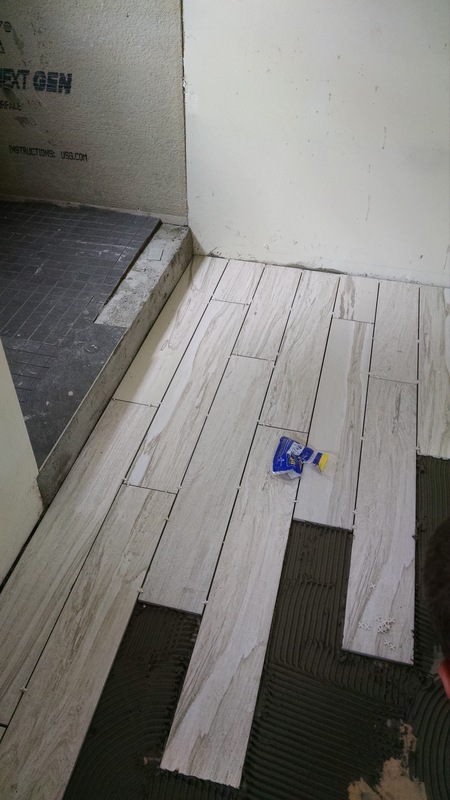 We then did our bathroom floors that we found on clearance…also at Lowes! $1.50/SF. 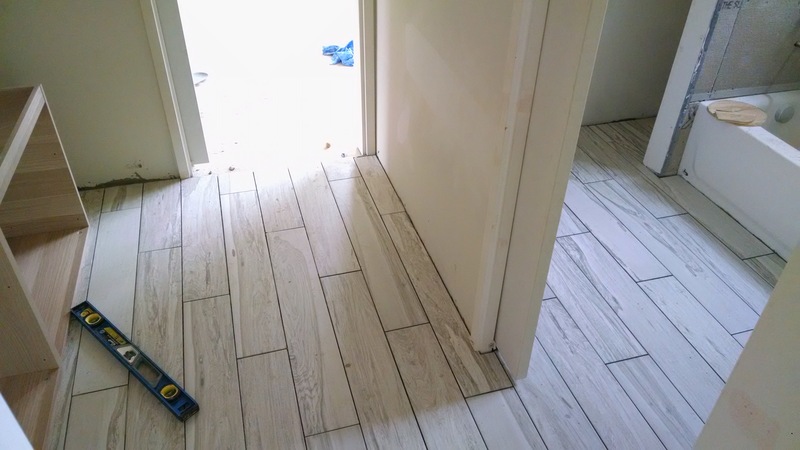 It’s one of the wood grain type of tiles…but grey and white and a pretty broad mix of grain types…almost looks more like stone than wood texture. And these are 6″ x 3′. 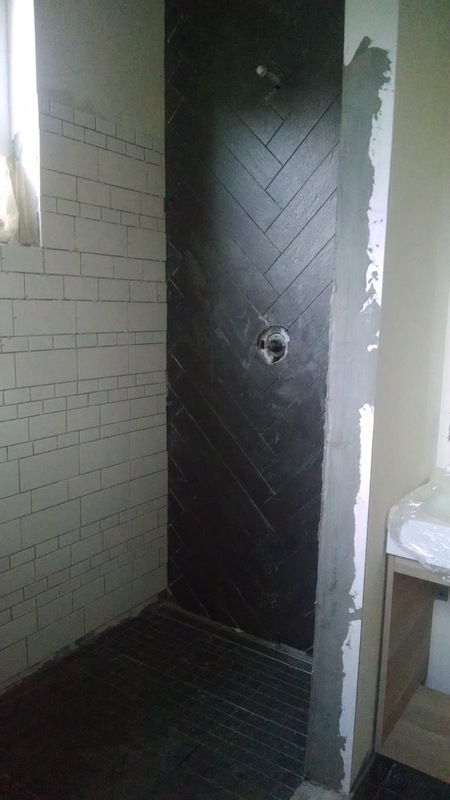 And then the walls…we wanted to do something fun on the shower wall…so we took the grey floor tile we used and cut it in 3, and put it up in a herringbone pattern….Robyn was pretty excited we could get that tile pattern somewhere! 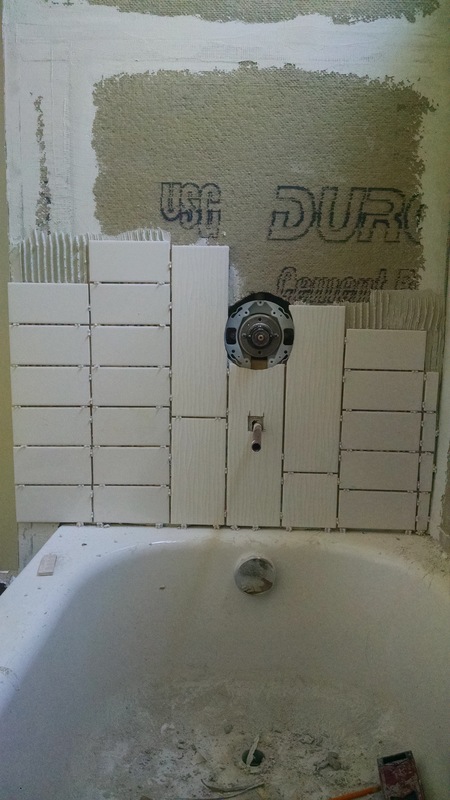 And then on the walls…we used 3 different sizes of white rectangle ceramic tiles in a random order to mix up the standard subway tile wall a little bit. Debated using dark grout…but decided it’s busy enough! So will be doing white grout in the white tile and dark grout in the dark tile. 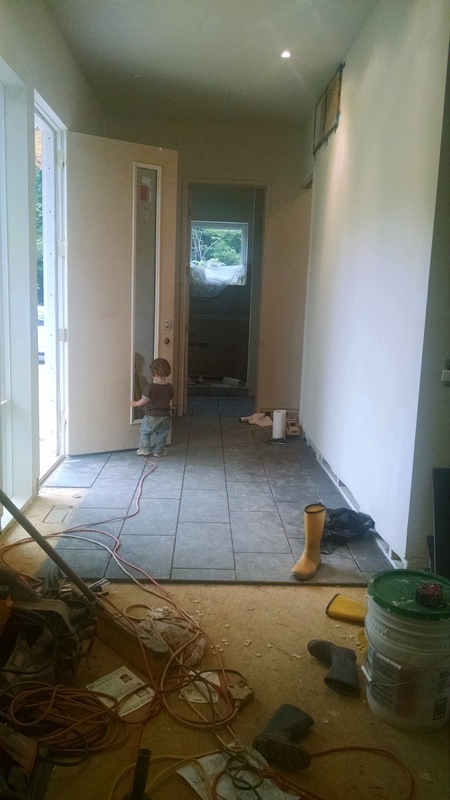 And with a little help from Sawyer…we used the same grey floor tiles in a 2×2 mosaic. We have a single slope floor to a 3′ long trough drain. Should look good! We hope! And as an INSTANT update…while I’m on a work trip in FL for the day…this is what Robyn is doing in the kids bath! Excited to see the progress!! Love my SUPER WOMAN! Couldn’t build this without her!